A National Seminar on Mahatma Gandhi: Tribal & Rural Development was held on 29th& 30th January 2019. The inaugural programme started with the welcome song prepared by students of Central School No.1, Udaipur under the direction of Shri Sadashiv Gautam, Music Teacher During the inaugural session Dr. M Sasikumar, Deputy Director & Head of Office, Anthropological Survey of India, Kolkata while welcoming the guests remembered the influence of Mahatma Gandhi in the thought and anthropology of noted social scientists Thakkar Bapa, Verior Elwin, and Nirmal Kumar Bose. Prof. V. K. Srivastava, Director, Anthropological Survey of India, Kolkata in his opening remarks reiterated that Gandhian philosophy spoke about the human body, village, and nation for human development. Dr.TilakBagchi Head of Office of Anthropological Survey of India, Western Regional Centre, Udaipur introduced the theme of the seminar. Shri D.C. Jain, RAS, Director, MLV Tribal Research & Training Institute, Udaipur was present as chief guest. He in his speech spoke about Gandhian Model of economic development. 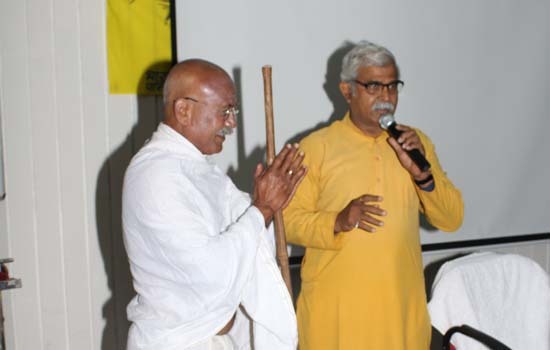 Prof. Naresh Kumar Bhargava, Former Professor of Sociology, Mohanlal Sukhidia University, Udaipur in his speech as a guest of as Guest of Honour, discussed Gandhian philosophy from a sociological point of view. Prof. S.L. Sharma, Professor of Sociology and Director Post Graduate School of Social Sciences, Rajasthan University, Jaipur delivered keynote addressed. In his speech, Prof. Sharma described Gandhian Philosophy of Swaraj and Sarvodaya from a sociological angel. Dr. Umesh Kumar, Sr. Ecologist offered a vote of thanks. Shri Vilas Janve, former Programme Officer, West Zone Cultural Centre, Udaipur was present as an anchor. After the inaugural session, a book exhibition on Mahatma Gandhi was inaugurated by Prof. N.K. Bhargava and Shri D.C. Jain. More than 40papers in five different sessions namely Mahatma Gandhi and Indian Tribes, Mahatma Gandhi & Rural Development, Gandhian Social Thinking and Organization, Gandhian Philosophy and Thought, and Mahatma Gandhi-Rural Reconstruction and Development in Contemporary India were presented in the two days seminar. Eminent scholars from different disciplines like Anthropology, Sociology, Social Work, History, Geography, Political Science, Philosophy Hindi Literature, English Literature, Drawing & Painting, Gandhian Philosophy, Administrator including experts in the field of Forest Management and Himalayan and Environmental Development, representative of NGOs following Gandhian Path presented their paper in the seminar. Eminent scholars including Prof. B.P Bhatnagar, former Vice-Chancellor, JRN Rajasthan Vidyapeeth (Deemed to be University) and Regional Convener, INTACH chaired the different session. Various scholars including Dr.Umesh Kumar, Sr. Ecologist, Dr. R.P. Mitra, Asstt. Professor, Dept. of Anthropology, University of Delhi, Dr. K.M. Sinha Roy, Head of Office, Anthropological Survey of India, Eastern Regional Centre, Kolkata and Shri A.J. Biswas, SSO, Head Office, Kolkata were present as co-chairpersons. Scholars from Rajasthan, Gujarat, Madhya Pradesh, Uttrakhand, New Delhi and West Bengal participated in the seminar. Besides academic sessions in three special sessions presentation of invited speakers namely Smt. Kalpana Palkhiwala former Deputy Director, Ministry of Information and Broadcasting, Govt. of India spoke about songs for Mahatma which was based on her research and compilation of more than 100 songs on Mahatma Gandhi in 14 different Indian languages , Shri Vilas Janve, Head, Martand Foundation, Udaipur and Shri Sikandar Abbas, National Behurupia from Gujarat had their interactive presentation on Gandhiji describing folk performance with special reference to Behurupia art. Shri Ashwani Kabeer Sharma who presented his paper on ‘In Search of Gandhiji among the Nomadic Communities’ was also the prime attraction of the seminar. Valedictory session was chaired by Prof. V.K. Srivastava, Director, Anthropological Survey of India. Prof. Srivastava in his address told relevance of Mahatma Gandhi in contemporary India as reflected from the presentation of the two days seminar. Prof.J.P.Sharma, Vice Chancellor, Mohanlal Sukhadia University, Udaipur in his speech as Chief Guest told that Gandhian model of development is more relevant in contemporary Indian nation building. Prof. Puspa Motiyani, former Dean and Head, Peace Research Centre and Dept. of Gandhian Philosophy, Gujarat Vidyapeeth in her first valedictory address described the role of Mahatma Gandhi in changing tribal lifestyle. Dr.ChandrakantUpadhaya, Director, Gujarat Tribal Research & Training Institute, Gujarat Vidyapeeth delivered second valedictory addresses where he has narrated about Mahatma Gandhi and his role in tribal and rural development.